P-LP-450 Hose: 50 ft, 1/2" Inside Diameter, Size 4 Features: -Durable proprietary CPC powder coat process. -Rolled edges and ribbed discs provide strength and safety. Made in the USA, sold worldwide. -Spring Driven Compact. 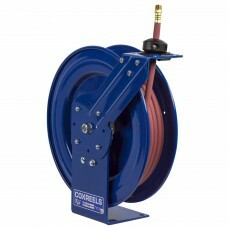 Product Type: -Air Hose Reel. Generic Dimensions: -1'' solid steel axle with 1'' lubricated precision bearings. Dimensions: Hose Length: -25 Feet. Overall Product Weight: -24-48 Pounds.